For the year 2019-20 the IHBC's membership fee is £124, with a Concessionary Rate of £62 for those on an income under £17,500. IHBC membership should not cost anyone in the UK more than £100 after tax relief (or £50 for taxpayers with income below £17,500 and on the concessionary rate) as all members may claim IHBC fees as a professional expense against their income. See below for details on claiming relief on fees. To minimise the cost of your membership fees please read this guidance. Please also note that, as a charity, the affordability of the IHBC's services is a priority for the Institute provided it does not undermine our charitable objects. If you have not claimed tax relief before you may be able to claim retrospectively for up to four years, be sure to check with your local tax office. Depending on your income, you could get back almost half of your fee through reductions in tax. 2. INCOME BELOW £17,500? PAY ONLY £62! In line with our new concessionary rate if your annual income is below £17,500 you may qualify for the concessionary rate and only pay £62 for the full IHBC service. Download the Concessionary Form HERE. Proof of income is required before the concession can be confirmed. This payment also qualifies for tax relief under 1 above. 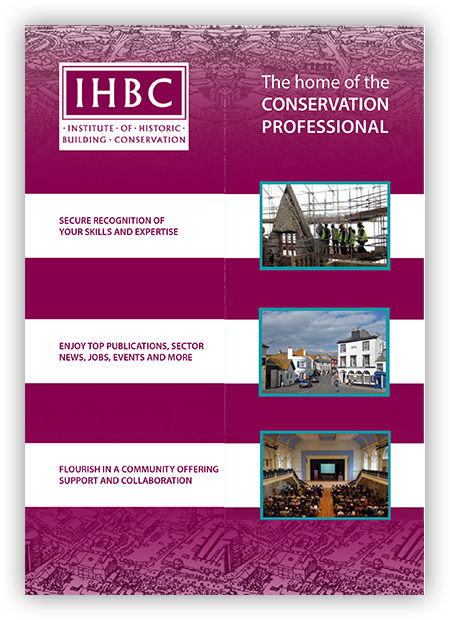 For queries contact our Membership Services Officer at membershipservices@ihbc.org.uk. 3. RETIRED? PAY ONLY £62. If you are an existing member and no longer practising as you are retired, and you want to maintain your membership benefits and contacts, please contact our Membership Services Officer at membershipservices@ihbc.org.uk to confirm your circumstances. After moving to retired status you may feel that you wish to continue to practice after all. It is possible to return to being a Full Member for up to 5 years where full CPD records can be supplied for the intervening period. Many employers pay for one or more professional subscriptions. IHBC fees ordinarily qualify for such payments, depending on your job. If your employer does not pay your IHBC fees, be sure to claim fees as a tax relief under 1 above. 5 HELP US TO HELP YOU: DONATE TO IHBC NOW! The IHBC is a registered UK charity and our work is guided and regulated by charity law across the UK. If you would like to help us improve our support for conservation please consider making a donation towards our charitable activities. Donations might take the form of financial contributions, or other transfers such as the return of expense payments made using our Expenses Form. Any donations will help cover the costs of our operations. If used with Gift Aid a donation will cost you substantially less than it benefits us, again helping keep your subscription costs down. If you would like to learn more about donating please write to our Honorary Treasurer at donate@ihbc.org.uk , or follow the links on our web site. FEE SUPPORT: If you are facing circumstances that mean our fees are not affordable then you should apply for the IHBC’s fee support. To find out more please follow this link. If you make a successful case for fee support we can make reimbursements, typically 50% of your fees.